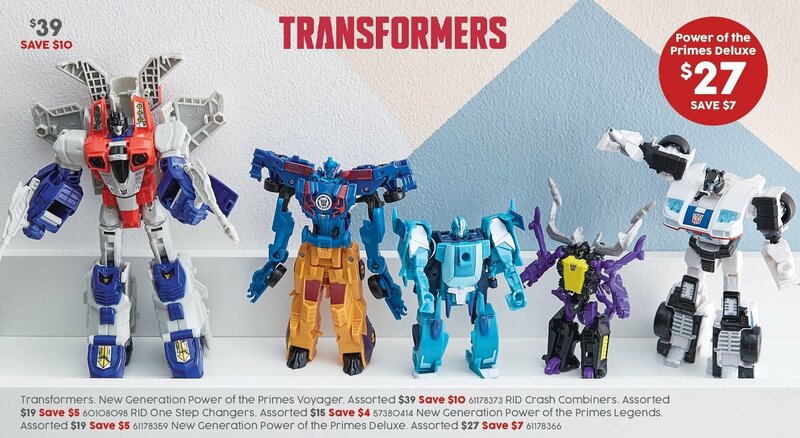 Target has some PotP & RID toys on sale in the current catalogue - March 1st to 14th. EDIT: There are other older stock on sale too. Target has some PotP toys currently on sale. (Don't know when the sale ends so Mods please modify thread title once known. Thanks). Wish somewhere would put the leaders on sale. $90 is steep for Rodimus. That's why I'm happily waiting on TLTC for my POTP figures. For Hasbro quality paint jobs and QC the standard retail prices seem too high this time around. Doncaster had at least one of each Legend and Deluxe. Had 4 Starscreams as well. Parra Target has been cleaned out except for two V class Starscreams. Managed to get Slash, Dreadwind and the Prime Masters at Target Broadway & Grimlock, Swoop, Slag, and Beachcomber at Target Carlingford. As an aside, does anyone know if Jazz is shortpacked in this wave? He's the only one I haven't seen. (Not that I'm after him - I'm happy with my RtS version). (snip)... As an aside, does anyone know if Jazz is shortpacked in this wave? He's the only one I haven't seen. (Not that I'm after him - I'm happy with my RtS version). I believe PotP Deluxe wave 1 came in a case pack of 8, with an even spread two each of Slug, Swoop, Jazz & Dreadwind.